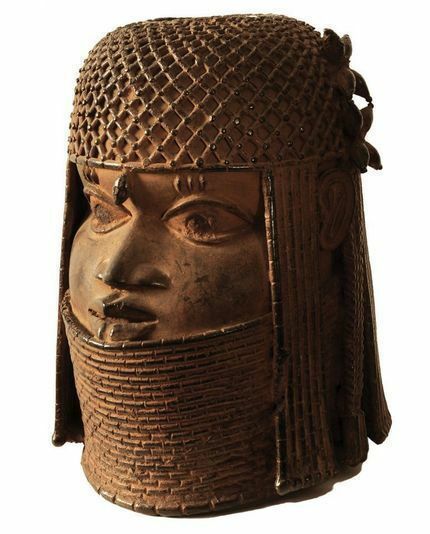 A bronze head from the Kingdom of Benin, now Nigeria, from the collection of the Museum für Kunst und Gewerbe in Hamburg. Photo: MKG Hamburg. The meeting follows French President Emanuel Macron’s decision to commission a groundbreaking report that recommends the permanent restitution of thousands of colonial-era artworks looted from Africa. Macron declared that restitution of looted artifacts would be a “top priority” for the government while he was traveling throughout Africa in 2017. “Germany has missed the chance to make a big political gesture like France, but this document shows it is taking the subject very seriously,” Jürgen Zimmerer, a professor of African history at Hamburg University, told the Art Newspaper. Germany’s federal culture minister, Monika Grütters, called Wednesday’s meeting a “statement of historical responsibility.” In February, Grütters announced that $2.17 million in government funds had been secured for researching artifacts that entered museum collections during the colonial era. The funds are to be administered by the German Lost Art Foundationfounded by the German federal government in 2015 to assist with the restoration of Nazi-looted artworks after World War IIand grant recipients will be selected by an eight-person committee. The French art historian Bénédicte Savoycowriter of the 108-page report released by France last Novemberwill sit on the committee, as will Albert Gouaffo of the University of Dschang in Cameroon, Barbara Plankensteiner of the Hamburg Museum of Ethnology, and Ulrike Lindner of Cologne University.